-The Loop teapot steeps your favorite loose leaf tea and pours like a dream - a special collaboration with Shannon Tovey. The Loop teapot is a unique pottery piece that will enhance your tea drinking experience. A perfect excuse to have a teapot, this modern Teapot is made from porcelain and boasts a built in tea strainer that showcases the best of contemporary design. The Loop Teapot is American Made studio pottery that would make the perfect gift for the tea lover. Adding modern pottery to your daily drinking ritual will add art to your home. Pair the Loop Teapot with the unique mug design of the Monday Mug to have the full tea set. Additional colors available. The grid of colors can be seen in the 5th image. Product dimensions The Loop teapot is 9" x 6" x 6" and holds 36 oz of tea or three 12 oz cups of Monday mug tea. The Loop Teapot is microwave and dishwasher safe. Process The Bright Angle is working to bridge the gap between design and craft by focusing on home goods that are American Made. We begin our creative process by sketching or sculpting prototypes. In order to ensure that we are able to see the smartest design come to fruition, we transfer the sketch to a computer aided modeling system. We use 3D prototyping and mold/jig systems to create efficient production systems that are executed by a highly skilled team of makers. Once we have a model we are satisfied with, we scale it up to account for the shrinkage of the porcelain. Next, we pour plaster around the model to create a mold. This mold is filled with liquid porcelain to recreate the object. We refine the porcelain object using hand tools and cover the object in our soft satin glaze and fire it in a kiln to 2200F. Once it is fired we sand the bottoms smooth. We make everything from scratch by formulating our own porcelain and glazes to be durable and unique. The Bright Angle sources our wood, glass, and other material components in collaborations with local craftspeople that share our commitment to American-made and thoughtfully sourced raw goods. We believe that good design is a marriage of concept, process, material and utility. Materials The Bright Angle sources our wood, glass, and other material components in collaborations with local craftspeople that share our commitment to American-made and thoughtfully sourced raw goods. We believe that good design is a marriage of concept, process, material and utility. The porcelain is the highest quality mixture of raw materials creating the most durable and structurally sound ceramic material - made in house. The porcelain is made from the highest quality white clay (kaolin), glass (flint or silica), and glass melter (feldspar). We fire our porcelain to cone 6. We take pride in the purity of our materials. We use the strongest and most consistent we can for our design applications. We source our leather and glass from like-minded makers in the Asheville, North Carolina region. Care Our products are designed with the intention of heavy everyday use. Each product is food safe and water resistant. Each piece of handmade pottery is meant to be used and loved every day as well as being a piece of art for display. The handmade pottery may be put in the dishwasher, oven, and microwave. 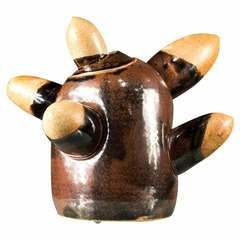 However, pottery is breakable and should be protected from obvious shocks like dropping it and from sudden changes in temperature. Uneven heating can cause it to crack. With proper care, it should last until you want something new. Some products will get scratched over time with lots of love and use. Many collectors treasure their pottery and are back for a new set of dishes with no complaint, because they don’t want to use anything else. The Bright Angle The Bright Angle believes in making art for the home producing the best gift ideas for wedding gifts, holiday gifts and other special gift giving occasions. Working closely with the Asheville NC art scene we provide handmade gifts working with technology such as 3D printer designs and laser cutter designs to form our prototypes. Our focus is on bringing collaborative contemporary design to the forefront of studio pottery and studio art. 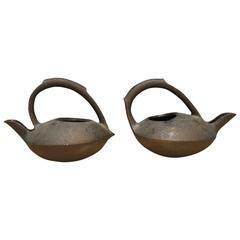 Stunning pair of glazed ceramic teapots by Anne Hirondelle (B. 1944) titled "Ishin Denshin". Each is signed on bottom from a San Francisco estate. Signed ceramic piece with no damage or repairs. The lid is non-functioning & fused onto the vessel. As such, this piece is sold as a decorative item. Five sausage shaped protrusions. Signed. 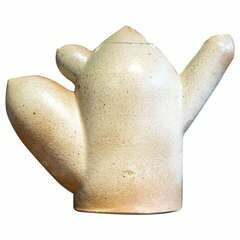 Scandinavian ceramic teapot with smaller minor structural damages but still in full working condition. Sandra Davolio "Coral Flower II", 2018 Porcelain. An English pottery Christening mug for Issac decorated with a black print and pink lustre.